The cathedral of Troyes, but it will not be finished until 400 years later, after innumerable incidents. This game invites you to experience four centuries of history by participating in the development of one of the finest medieval cities ever to make its mark on Western culture. The society of that day was organized into three orders: the nobility, the clergy, and the peasants. The nobility constituted the military force devoted to justice and to protecting the lands. The clergy were the spiritual guides of the community, contributing to maintaining and developing knowledge and culture. The peasants and artisans, in turn, were given very little consideration, although their hard work was essential to the daily life of the entire populace. 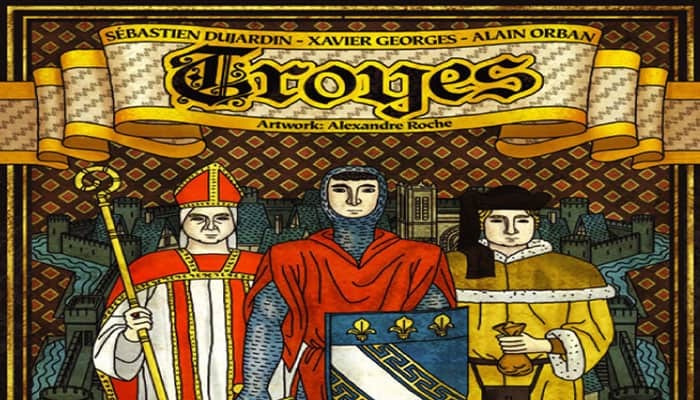 Each player manages their segment of the population (represented by a horde of dice) and their hand of cards, which represent the three primary domains of the city: religious, military, and civil. Players can also offer cash to their opponents' populace in order to get a little moonlighting out of them-anything for more fame! 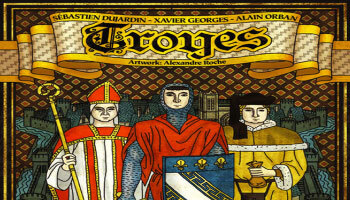 Troyes is a strategy game in which you represent a rich family from the Champagne region of France, using your infl uence to recruit and supervise individuals from the three prominent domains: military (associated with the color red in every aspect of the game), religious (white), and civil (yellow).